BBK DAV Recreates History, Lifts Overall Championship Trophy in Inter-Zonal Youth Festival of GNDU After 19 Years. Continuing its winning streak, BBK DAV College for Women won Overall Championship Trophy in Inter-Zonal Youth Festival of GNDU, held at Apeejay College of Fine Arts, Jalandhar from November 13th -16th, 2018. The college won the championship trophy by scoring 120 marks and winning positions in all the 26 events in which the college participated. The college emerged champion in literary, theatre & folk events while bagging runners-up positions in the category of Fine Arts & Music. Participants made their mark by winning 1st position in 11 events, namely Kavishri, Folk Song, On the Spot Painting, Collage, Phulkari, Skit, Fancy Dress, Quiz, Debate, Poetry and Gidha, 2nd position in 13 events, namely Folk Orchestra, General Dance, Classical Vocal, Non Percussion, Classical Dance, Group Song, Vaar Singing, Western Solo, Rangoli, Play, Mime, Elocution and Poster Making and 3rd position in 2 items namely Western Group and Group Bhajan. College student Suvidha Duggal was presented the Best Actress (Theatre) Award and Simran from Gidha team won the award for Best Dancer. Principal Dr. Pushpinder Walia congratulated the Youth Welfare Department on putting in its best efforts. She said that the college has been the proud winner of GNDU Zonal trophy for decades together and winning the Inter-Zonal trophy after 19 years has added another feather to its cap. Principal attributed the trophy to the joint efforts of the entire faculty and students. Amidst all fanfare, the championship trophy arrived in the college and the whole campus became abuzz with excitement. 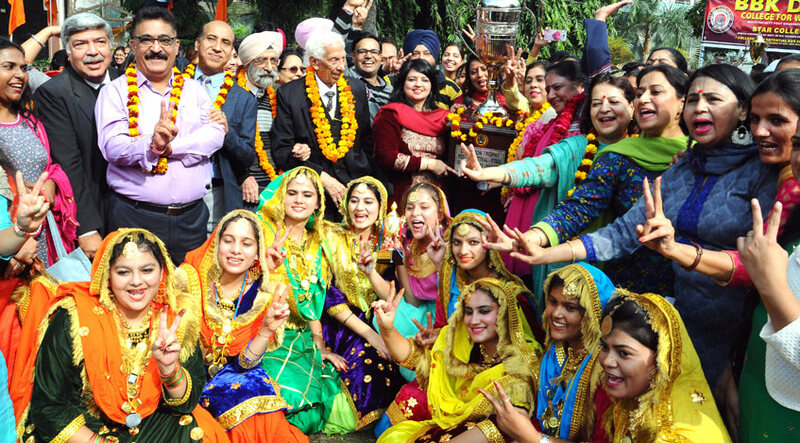 In a jubilant mood, the staff and students of the college celebrated the victory and danced on the beats of Dhol. Sh. Sudarshan Kapoor, Chairman, LMC, S. Mohinderjit Singh and Sh. Vipin Bhasin, Members LMC, Mr. Naresh Kumar, Dean Youth Welfare, Mrs. Mandeep Sokhi and Dr. Lalit Gopal, Associate Deans, along with all office bearers, faculty and students, felicitated the winners.